Organized criminals, some operating in the US, are smuggling the valuable body part of the majestic creature. 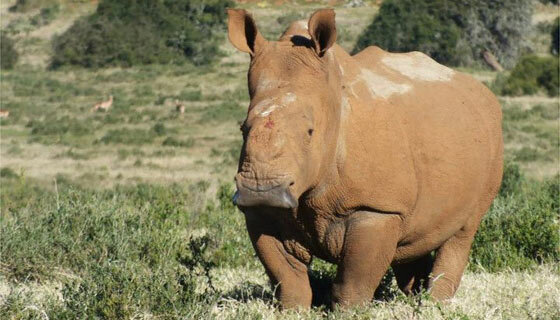 On a grassy expanse somewhere in South Africa’s Kariega Game Reserve in March, a male rhinoceros struggled to its feet, hobbled several paces, and then thudded back down under its own weight. The beast’s iconic horn had been macheted off by poachers, and all that remained was a mound of raw, mutilated flesh. Not too far off, the carnage was even worse. Sprawled beside a bush, a female rhino heaved for air on a patch of grass damp with her own blood. “I just thought surely we can’t save this one,” says wildlife veterinarian Dr. William Fowlds in the footage below, as he examines the bull’s injuries and tends to the aftermath. Wait, this is just an isolated incident, right? Why the recent uptick in rhino poachings? How do the poachers operate? What is the most effective method of thwarting this sh*t storm? University of Montana wildlife biologist Joel Berger, an expert in hoofed animals, spent three years in Africa closely evaluating the practice of removing rhino horn safely down to the base as a conservation strategy. “The idea being, of course: no horns, then no incentive to poach,” Berger told Mother Jones. But 90 percent of the dehorned white rhinos that his PhD student tracked in Zimbabwe were still targeted and killed by the poachers for their nubs. What’s more, the dehorned mama black rhinos that he studied himself in Namibia were unable to protect their calves from pesky hyenas. Berger advocates funneling more funding into armed guards and the fortification of game reserves. “That’s the only thing that has really been effective for reversing the climbing trend,” says Berger. Well, at least the rhino horn trade is one evil thing Americans aren’t participating in. Think again. The Deputy Chief of Law Enforcement for the US Fish and Wildlife Service (USFWS), Edward Grace, is calling the US rhino trade his “number one priority.” Grace told Mother Jones that the eight arrests his agency has made on US soil thus far in 2012 are “just the start of” a widespread crackdown. When asked for an estimate of current investigations, Grace declined to comment, reiterating that the investigation was ongoing. But he did say the agency has served search warrants and conducted interviews related to the investigation, dubbed “Operation Crash” after the term for a rhino herd, in more than 25 states. When did USFWS get on the trail of the rhino horn trade? Who else has been busted? The USFWS has taken down quite a colorful assortment of bandits beyond just Irish gangsters and, as Grace says, there will be more. Back in February, they arrested a Chinese national, Jin Zhao Feng, who had coordinated dozens of rhino horn shipments to his home country, after he got off a plane at LAX. The agency also nabbed some of Feng’s suppliers: ex-professional rodeo cowboy Wade Steffen, father-and-son team Jimmy and Felix Kha, and Mai Nguyen, the owner of a nail shop that was receiving horn shipments. Steffen had been stopped at Long Beach Airport earlier in February, where a search of his luggage turned up $337,000 in cash, some of it stuffed in a diaper bag. In later searches, USFWS and ICE officials discovered 17 packages with 37 rhino horns, $1 million in gold ingots, diamonds, Rolex watches, and another $1 million in cash. Last month, 67-year-old New York antiques expert David Hausman, who was picked up at around the same time, plead guilty to obstructing justice for posing as an informant to USFWS while covertly purchasing horns himself. In both cases, the horns discovered were sourced from the critically endangered black rhino, though many of them likely came from old trophy mounts sold in auction houses and antique shops. At the end of the day, Grace hopes that choking off part of the black market here will do something to halt the brutal poaching back in Africa. “There’s no reason a majestic species like that should end up going extinct because of a myth,” he says. Happy Birthday Endangered Species Act!